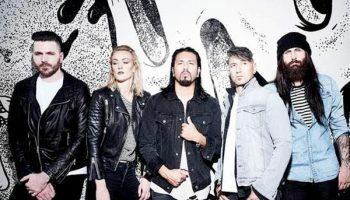 Interview: Pop Evil’s Frontman Leigh Kakaty Talks Oz Tour – Spotlight Report "The Best Entertainment Website in Oz"
Pop Evil formed in singer Leigh Kakaty’s garage in 2001 and have been building a strong fanbase ever since, conquering the US, Canada and then Europe with their unique style. A band that must be seen to be believed, they are best known for the energy of their live shows which is regularly compared to that of mega bands like Mötley Crüe and Kiss and unwilling to put themselves in a particular box, their sound is constantly evolving, drawing even more attention for this dedicated band. Thanks to John Howarth of Bullet Proof we got to chat with frontman Leigh Kakaty about their self-titled album and their first ever tour of Australia. SR: How are you guys feeling about playing Australia for the first time? LK: Oh, we’re real excited. It’s been a long time coming and finally now – I mean on the horizon – to have our first Aust tour, it’s pretty humbling, it’s special. We’re excited. SR: Fantastic! 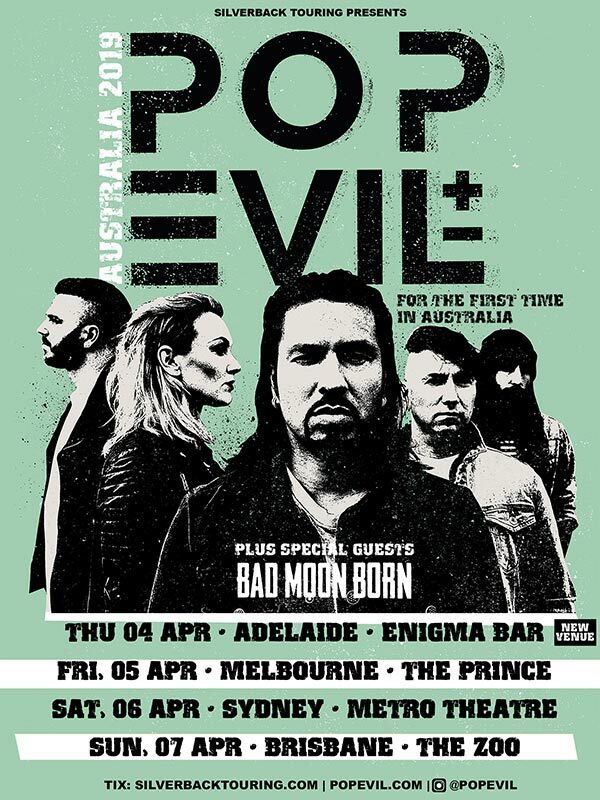 And what can Australia Expect from Pop Evil’s live shows? LK: A lot of energy, a lot of high energy on this show. Obviously, first tour in Australia, everyone’s gonna be at an eleven on a scale of one to ten, we’re all gonna be at an eleven or twelve, so the excitement and the energy is going to be at an all-time high – that’s what we’re known for too here, you know in the US, is just the energy we bring to our live show. So, I expect nothing but the same when we debut our band in Australia, it’s gonna be exciting for us. SR: Yeah, I’ve actually seen that your live shows have been compared to bands like Mötley Crüe and KISS in terms of energy. What do you think of those comparisons? LK: Ah, minus the pyro. Minus the fire [laughs]. It’s a big compliment. Obviously, those bands are mega bands so to be able to be compared with the likes of those bands is always an honour. But we don’t really worry about that stuff – we’re a band that still has a lot to prove, and we have a lot to work for still and again, the live show is where it’s at you know, we’re a band that brings a lot of energy and emotion to the show, so we give you a lot of different feelings relatable to life, you know? Sometimes you’re happy, sometimes you’re sad, sometimes you just wanna you know, put your hand through a wall – I mean, you get all of that at a Pop Evil show. We like to give you the peaks and valleys that are relatable to life. So that’s kind of our thing. SR: I’m just going to jump around a bit – do you have any pre-show traditions that you need to do before you go out on stage? LK: Ah, you know, not really, maybe in the US, we have our routines, I don’t know if there’s any rituals so to speak, it’s just you know, obviously every band member – this is our twelfth/thirteenth year since our record deal, so we all kinda have our ways to kinda get our own space. You know, when you live on a tour bus you gotta find ways to get yourself pumped up separately and then sometimes we get together and there’ll kinda be more team motivational opportunities. But you know, when you travel to another country – this is our first time, we’re basically starting over in some ways, so the routines kinda get thrown out the door when you travel. And of course, with the long flight to Australia – and then I think we fly to every show too. There’s no tour buses through the outback – it’ll be a whole different world for us. It’s the longest flight we’ve ever had playing in other countries. As a vocalist, that’ll be an interesting challenge, but, the little things we do before the show, I don’t know if it will be anything crazy, it will just be getting together and just being grateful to see how many people are coming out to the shows this early. And obviously it’s our first time playing the country so it’ll be interesting to gauge who’s listening and who knows the band already this early and we’ll just rock as hard as we can for them and just start from the ground up like we did in the US, Canada and Europe and you know, just do what we do live and hopefully we can continue to grow the band in Australia, even quicker. SR: Building on from that, you’ve said you’re always trying to create new ways for people to listen to Pop Evil – for people who don’t know you yet, what would you say to get them to come and check you out? LK: Well, a big portion of it is the live show. I think there is something so beautiful in rock bands – seeing a band come together with four or five people on stage being able to play real instruments. There’s so much EDM and people on computers and laptops these days that the art of playing instruments is [laughs] kind of a lost art form, so you know, the one thing we love about playing other countries, is there’s such an appreciation for live music – differently than in the US, it’s just, everything is so saturated over here, it’s a lot of work. I mean, some of our friends that are in bands from other countries love the US because there’s just lots more opportunities in ways, but it’s harder, you know, because there’s so many people who just wanna listen to Country and Hip-hop and other genres. And rock, it’s got this saying that rock and roll is dead – I mean what other genre has a saying like that!? It’s pretty – pretty crazy. I know it’s funny for people on the outside looking in, but when you’re actually in it it’s just very depressing, I mean “rock and roll is dead”!? I mean, give me a break, man. We see people in hundreds and thousands and ten thousands pretty regularly. So, there’s just definitely a very big scene for live bands and rock and roll and metal especially. We’ve heard nothing but great things about Australia and how hungry the country is for metal and rock so we’re so excited to just get our first taste of it. I’d say that that energy definitely is something worth having when coming to see us live. 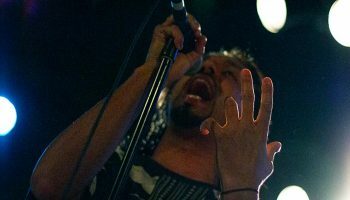 Also the variety of emotion, you know, whether it’s the peaks and valleys that again are relatable to life, I think that if you’re a fan that likes to come to a show and not just get the same song or the same sound over and over and over, Pop Evil is definitely the band for you – there’s so many songs that don’t even sound like we’re the same band. We pride ourselves on being able to just play songs we feel we play good, you know? And if we can play those songs good, we’re not afraid to put them in our set, but we don’t try to put ourselves on a shelf that doesn’t exist anymore in a music store. Music stores don’t even sell music or CDs these days, you get them on your phone or you get ‘em on a playlist or you get ‘em on YouTube, so we don’t have to put ourselves in a box and try to write the same song over and over – we’re had very much success just being ourselves and writing the music that we feel we can translate and take to the stage and you know start to put and develop in our live show. SR: And what inspired you to self-title your latest album? LK: Well, we had a new lineup for one thing, so that was a big sense of inspiration and it just felt like, for the first time in our career we started to know who we are off the stage as well as on the stage. So, it really felt like for the first time we had arrived, and we really feel like we know who we are and who we want to be moving forward as we create more music in the future, so I think that was a big part of it. It felt like our first record in so many ways ‘cause again rock and roll is in a different place, so it’s not like labels give you lots of money to experiment yearly, to figure out who you are in the studio. ‘cause anybody can write songs and play songs but sometimes when we record songs in the studio they just don’t come off with the same energy, or there’s something missing, so a lot of times in the old days you were able to experiment and record it and take your time, you know, figure out what songs best suited you or your band. For us we didn’t have that luxury, pretty much we recorded the songs and whatever we cut we had to release, we didn’t have money and time to waste, and most bands are in the same position we’re in, so you know we were basically experimenting and growing in front of our fan base here in the US, that’s how we started you know, and now it just felt like okay look we had success, we had these big hits, it’s important for us now to focus on who we are now moving forward so we can again put all the energy into that live show and make sure people when they come see a Pop Evil show, they’re not confused by our identity – they can understand who we are and where we are going. And that takes time, you know, I mean you think about some of these bands that we know and love we’ve watched them for years – for decades you know, and they become a part of our lives. As we can fine-tune our direction and our identity, that can only help us with our fan base and not make people be confused about who we are and what we’re trying to do and what we sound like so again I think that’s why the self-title felt like we were a huge step in that direction. SR: Fantastic! I wanted to ask you about the song Waking Lions from that album. It’s very empowering. Can you tell me what the story behind it was? LK: Thank you. 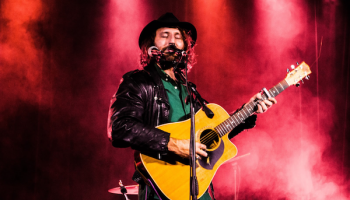 I have a couple different stories about this song – brutal, brutal song to write on me, ‘cause it was one of my favourites I’ve probably ever done to this point, you know, and not just for the melody and the hook and the song. It was just I needed that song in my life to again remind me, there’s a lot of things in this business that can really I guess depress you or have you have second thoughts – is this is what you really wanna do – and I’m sure all of us musicians go through it at some point but, it just felt like if I really wanted to do this I gotta find that inner lion inside of me and just wake him up and remind him: look at life from a glass half-full perspective rather than a glass half-empty and be a true leader and a true front man and get out there and get through these tough times and I think I wrote the song choruses first and it took me about a year. Literally in the fourth quarter I came up with the verses. I didn’t know if the verses were right – I was rapping them, screaming them, they were heavy, they were whatever they were. And literally – it must have been a Sunday night – it was literally a year to the day that I wrote it and we had to release it Monday morning. It was going off to US radio in the morning and pretty much once it’s on the radio that’s it, so I remember we had the song done Saturday night and I had a dream about it and I just knew it wasn’t right, I was like something’s off. And whatever we were doing that Sunday, I came into the studio early and I’m like “we need to scrap everything today and I’m gonna do the verses on Waking Lions over ‘til I get it, ‘cause they’re not right”. I went in and I think I spent from twelve in the afternoon to – I think ten o’clock pm was our cut off time – so it was right around I don’t know nine-thirty or nine-forty and it was like “look, we gotta get this. This is your last take, let’s just do it” and literally the last take is what we went with and there it is to this day. So it was a very stressful, pressure-full song for me ‘cause I wanted it to be perfect and what it ended up turning out as – it was exactly that, it was perfect and it is what it is now, it’s all – what do they say – it’s all history now, but stressful time for me man, that song, a lot of meanings for that song for me. SR: So, it was worth all that brutal, stressful time? LK: [laughs] Yeah, it was – all the grey hairs, right? SR: Earlier, you mentioned depression. In the song Rolling Stone you say, “it’s only music but it keeps me going”. I feel that is a very honest statement for many people who listen to or play music. Why do you think that is the case? LK: First of all, I’m impressed, that’s a lyric from way back in the day – in the way, way old school Pop Evil catalogue, so kudos to you for knowing it. I think it’s awesome when – you always hear about timeless songs and when the songs you write, the songs that are older still are relevant to this day and it’s ironic that you know, I wrote those lyrics all those years ago and it’s still very much prevalent today. It’s only music to so many other people, but when it’s your music it’s your identity, it’s your pride, it’s your story and that keeps you going, it keeps me going and that’s what kept me motivated. It’s never been about fame or money or any of that kind of superficial stuff, it’s always been about taking your music to the world and other countries, you know, getting the chance to finally go to Australia for the first time with the band that I started in my basement, in my garage all those years ago – twenty-something odd years ago … to think that I’d be in Australia playing … but it didn’t happen overnight. Like I said it’s twenty years – or more actually – it took me to finally get my first tour, my first show in Australia. It’s just a testament that dreams can come true. The rock and roll dream takes a little bit longer, but persistence, dedication and of course you’ve gotta write good songs. I mean, that’s the challenge, right? Things can happen and you know getting up, as soon as you play in front of a whole different culture of people that like your band if you can give them the opportunity to hear it, it’s a huge honour, it’s something that is truly a win bigger than any money value or any kind of thing that you could have, just knowing that you have fans around the world is a huge honour that you take huge responsibility in, trying to be the best you can, to respect that rather than take advantage of that. SR: Following on from that, you’ve said that music is in your blood and it’s very clear that it is. If you weren’t a musician, what do you think you’d be doing for a career? SR: Very good answer! I’m sure all the fans feel the same way, I know I do. LK: Hopefully … hopefully. Thank you. SR: Okay, so what movie do you wish you were on the soundtrack for? LK: Ah, that’s a great question. What, like a current one or d’you want old school? If it’s old school movies, I always loved Huey Lewis Power of Love from Back to the Future, that was one of my favourite movies ‘cause as a young boy I always wanted to go to the future and get those self-lacing Nike shoes and that hoverboard for one, but I always loved Back to the Future. But I think now … gosh there’s so many … I’m trying to think … a Disney movie … I think maybe I would have liked to be on The Lion King, that was a good one. That’d be a kids’ movie. On an adult movie I would love to be on a Rob Zombie movie for sure. Any Rob Zombie movie would be dope. And in honour of our buddies in Motley Crue, I’d have loved to be on The Dirt soundtrack [laughs]. The new Mötley Crüe movie would have been fun to be on with a song with Mick Mars [that] would have been dope. There’s a good answer right there. SR: Well, you did work with him on Boss’s Daughter. LK: Yeah. Yeah, we should have had Boss’s Daughter on that soundtrack, it would have been perfect. SR: I also read that you were a big Crocodile Hunter fan. SR: Are you hoping to see some crocodiles while you’re in Australia? LK: You know what? I don’t want to get my hopes up. ‘Cause we heard – again, we’re flying to every show – so I heard that our time may be limited. And I’m a big adventurer when I get to a city I just bolt. I’m not a big soundcheck guy and I always kinda just rest my voice during the day and I come out – I’m like Allen Iverson I’m not a big practice guy. When it’s time to play let’s go, but I don’t like wasting my voice during the day. I’m real hopeful. Obviously, I wanted to go to Australia Zoo – but I don’t know if we’ll have time to go out that way. I’m just gonna be open-minded, man, everything is new to me in Australia so I’m really excited to see as much as possible. But most importantly just meet all the amazing people that I’ve heard are your way and just start building relationships and friendships with people there. I’m really excited and looking forward to that and making new fans over there. Just gotta be humble about it and just try to stay focused and be grateful for all the things. I can’t wait to try some different foods to truly know what is Australian – I was trying to even Google it, I was like what is “true Australian”, you know? ‘Cause I don’t even know. I mean, even though we heard a lot about Australia growing up, you always hear about Sydney Harbour and always see the Opera House and just like of course you think of France all we would see is the Eiffel Tower, so very stereotypical stuff to the Australian but that’s kind of very Westernised when you think of like how Americans grew up – that’s probably all they saw, at least from my perspective in Michigan. So, I’m really excited to see it. And of course, all the really warm weather and all the beautiful things in Australia, but also the terrifying things that are in the outback. You guys have the world’s craziest spiders, snakes, you name it man, there’s probably a sasquatch – the Australian sasquatch no one knows about. I’ll run into it. 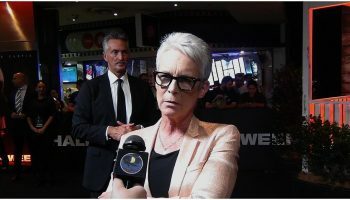 I’m just gonna stay away from the Outback for sure [laughs]. SR: We’re very proud of our dangerous animals. LK: [laughs] Yeah, I bet. I bet. I don’t wanna run into any of those things, man. I don’t need a Black Mamba sleeping in my bunk, no way! I don’t need none of that. That’s another thing, American TV and Nat Geo and all the programs – it’s always been fascinated with Australia. And I’d love to see the Great Barrier Reef to be honest, I‘d love to go see that. And I wanna go to Kangaroo Island, that’d be awesome, but I doubt I’ll get time to do some of that fun stuff, but if I do, you’ll see it on my Instagram page, ‘cause I’ll make sure I post about it, for sure. SR: I’m sure you’ll be back soon enough, you’ll have to fit it in then. LK: I hope so. Hopefully we can get back and maybe do some festivals. That would be an honour to do that. And then maybe after we do some shows, maybe we can get about seven/eight days [to] just kinda stay and be a tourist for a bit and enjoy the adventures that we can put on there in your great country. And maybe we’ll get to New Zealand as well – that’d be great. SR: Yeah, I know they’ll be looking forward to seeing you at some point. LK: Yeah, I know they’ve been excited and kinda been hounding us to get over their way as well so we’re definitely trying. Hopefully this is a step in the right direction. They’ve definitely got my word on behalf of me and the band, we’re going to do our part to just keep pushing for it every album cycle, so that’d be sweet. SR: Did you have any final messages for your fans over here in Australia that are looking forward to seeing you? LK: You bet! I wanna thank them first of all: thank you to all the Pop Evil fans for being patient for our live tour – it’s finally here. Literally on a plane on Monday, so we can’t wait. Not looking forward to that long flight, but once we get that over with then it’ll be all great from there. But we’re grateful, and of course if you’re on the fence and don’t know Pop Evil, we want to invite you personally – from me and the band – to come out and see us play. Hopefully you can be open-minded to see an American band that is trying to do our part, to make the investment in our Australian fans. We’re absolutely very proud and honoured to be playing for you and hopefully you give us the opportunity to – give us your time and come out and support us and hopefully we can build a friendship and a relationship with our music that will last a long time. SR: Thanks so much for talking with me and good luck with your flight. I’ll be thinking of you guys on Monday. LK: Thanks for having me. No problem. Thank you [laughs] yeah, when you’re in dreamland in your bed all comfortable. Bye now! 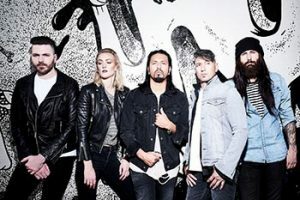 The self-titled Pop Evil is their fifth studio album and is available through label eOne Music.